When staff is working in a busy industrial environment such as a production line in a factory, ensuring that the greatest possible levels of ergonomic comfort are available will result in a workplace that is subject to higher levels of morale, fewer accidents, and which is more efficient than a comparable place where ergonomics are not such a major consideration. By supplying staff with industrial desks that offer them the right environment to work to their highest levels, you are able to give them a work place that will support and protect them completely. An industrial desk gives staff a place that provides them with all of the things that they need to carry out their day to day jobs in one place. The desks feature a hard wearing design in which great consideration has been given to providing the highest levels of structural strength possible at the same time as creating the largest possible area in which to carry out their day to day tasks. By using structural steel for the frame work, and factory welding all the joints, you create a desk that is extremely supportive, and able t handle extremely heavy weights if required. Thanks to the use of the open framework under the top of the industrial desk, it is possible to gain extremely easy access to the area underneath the desk. Multiple people can sit at the desk at one time, and in addition to this, different kinds of chair can be used for greater levels of comfort. Thanks to this flexibility of design in the form of the industrial desks available from Easy Rack, you can also take advantage of the area available underneath the table top, and use it for storing a variety of different items thanks to the range of different accessories that are available. 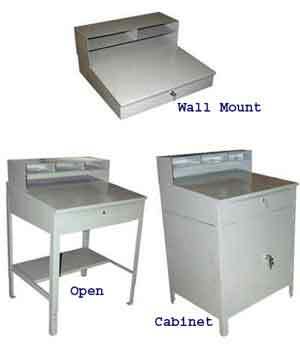 A variety of different under desk storage solutions are available to suit the needs of the individual. From three drawer units that are intended to store paperwork or documents through to larger cupboards that can handle tools or supplies, the different options can be selected to meet the exact requirements of the job that is being carried out by the person whose desk it is. If staff are working with materials that could be caustic, or volatile, it is important to be able to provide a work surface that is safe and sound. Laminated surfaces offer a particularly robust working environment that is highly resistant to damage, while wood composite table tops made to a high standard, and designed specifically for use on industrial desks are also available, and these provide an extremely hard wearing surface that will remain in good condition no matter what materials are being sued on it. Whether staff is involved in production or clerical work, if a hardwearing and comfortable workstation is required, an industrial desk is the ideal solution. Designed to be steady in use, and provide a high quality workspace that is built to last, and cost effective in a whole range of different circumstances. Easy Rack carries a wide variety of commercial shelving, material handling equipment, used pallet racks, and modular prefab buildings installed nationwide. If you can not find what you are looking for call us toll free at 1-888-776-3720 and we will find it for you. Our home office is located in Houston, Texas with warehouses located throughout the United States that enable us to service all 50 states including New Orleans, La., Cleveland, Ohio, Kansas City, Mo., Mesa, Arizona, Virginia Beach, Va., Omaha, Nebraska, Oakland, California, Miami, Florida, Tulsa, Oklahoma, Minneapolis, Minnesota, Colorado Springs, Colorado, Arlington, Texas.